* These items are all optional. Chicken and spring onion is the most traditional and popular choice! 1. Let’s begin by making the sauce. Add half a cup of each cooking sake, mirin and dark soy sauce to a pan with a few tablespoons of sugar. The ratio of these ingredients can be changed to suit your taste as all Japanese yakitori chefs have their own personalised sauce recipes. 2. Add a little cornstarch dissolved in water to the pan and heat the mix without boiling it before simmering gently. The cornstarch is useful for thickening the sauce, but this can be omitted depending on how you prefer your sauce. Allow the sauce to simmer on the stove until the volume has been reduced and it becomes thick and sticky. 3. Take your sauce off the hob and leave aside while we prepare our skewers. Soak the wooden skewers in water beforehand for a few minutes to keep them from burning when we grill our yakitori. 4. Make sure that you cut up your chicken into small bitesize pieces and slice your spring onion into approximately 3cm lengths. Start spearing the ingredients onto your skewers alternately so have a good mix of both chicken and spring onion. Now using a cooking brush, begin glazing the skewer ingredients with your yakitori sauce. 5. The traditional method for the next step is using an open flame grill with special aromatic charcoal sourced from Wakayama prefecture in Japan called Binchotan. Of course, this may prove to be slightly hard to source, so a normal barbecue should work nicely. Start placing the skewers on the barbecue in an area with a strong, even heat. 6. Keep turning the yakitori regularly so they cook evenly and brush more yakitori sauce onto the chicken each time you turn them. 7. Once the chicken has cooked to a golden colour they should be ready to serve, so place them on a plate in pairs and serve with a fresh coating of yakitori sauce. You can also use a little shichimi pepper powder here for some extra spicy flavour. 8. Crack open a cold one and enjoy one of the finest combinations known to man! 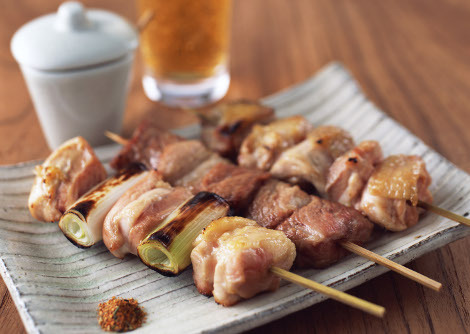 – Although yakitori is traditionally made with pieces of chicken and spring onions, there are many other varieties that you can try. Other options include pieces of pork, asparagus wrapped in bacon, chicken skin (yeap, just skin), chicken wings and various other vegetables to mix up with the meat. If you are feeling really adventurous, see if your local butcher has chicken hearts as these are delicious as yakitori! – If you prefer, you can purchase premade yakitori sauce to make things a little easier. However, it’s always fun to make the sauce too and it also enables you to make the sauce to your own personal taste preferences. – As we all know, the British summer is not to be trusted, so if you find that your planned day for a barbecue is stopped by bad weather, you can still create yakitori by cooking them in the grill section of your oven. – You can make vegetarian yakitori by using tofu and vegetables as a replacement for the chicken. Simply follow the recipe as normal, but use extra-firm tofu instead. Just make sure that you do not use soft or silken tofu as it will most likely fall apart when you try to grill it. Posted in Food and tagged Yakitori. Bookmark the permalink.